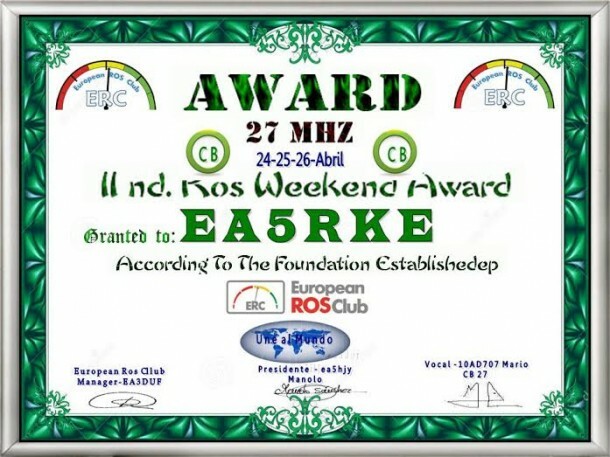 ROS WEEKEND 27 Mhz April 24 2015 at 00:01 UTC until Apr 26 at 23:59. In order to acquaint newcomers and continue to demonstrate the veterans utility, easy handling and operation of ROS mode, the ROS EUROPEAN CLUB, invites amateurs in the world, ROS Weekend, CB-27 a weekend Exclusive week so those interested can try the ROS mode and share experiences. 1. Date, from the day April 24 at 00:01 UTC until 26 at 23:59. 2. Call: CQ, CQ, ROS WEEKEND. 3. The certificate may be requested by any amateur or SWL. 4. For the DIPLOMA be needed 5 contacts. 5. The diploma will be awarded in ROS MODE. 9. The diploma will be sent by e-mail on DIN A4 in JPEG format. This entry was posted in CB-Radio-Hobby, Digital Radio Modes, News - CB Radio and tagged CB Digital Mode, Digital Radio Mode, ROS Digital Mode by 43ax005. Bookmark the permalink.